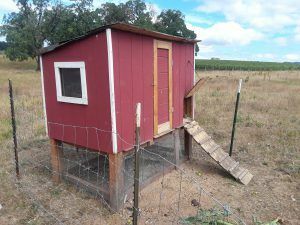 Raising Baby Chicks – Chirp Chirp - FREE CHICKEN COOP PLANS! If you are interested in raising chickens, you’re not alone. 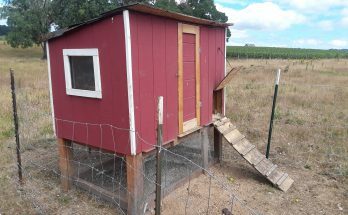 Wikipedia states that the growth of backyard chicken farming has exploded over the past decade. People get interested in raising chicks (and chickens) for varied reasons, but most people want chickens for eggs, meat, or both. Some people even want them as pets! There are a lot of varieties of chick breeds to choose from. So before you run to your local farm store and buy whatever chicks they have on hand, make sure you know what you want chickens for, and do your research! We have outlined details about different chickens for egg production here. In this article we’ll review different breeds of chicks that may or may not best suit your needs, what supplies are needed, and a few other tips to help get you started. Should I get Chicks Or Chickens? I know I know – chicks are cute and fuzzy…but they are also a bit of work upfront…so we wanted to mention another option to consider if you’re still not sure if raising chicks is for you. You can either buy chicks or hatch them yourself, but it takes about 5 – 6 months before they start laying eggs. With meat chickens, it only takes about 3 – 5 months to get them to a large enough size to butcher. Those few months may not seem like a long time, but it still takes some work to raise them, along with feed costs. Something to consider is simply buying adult chickens. They may cost more upfront, but the labor and expense of raising chicks has already been done, so you have birds that are all ready to lay eggs, or provide meat for the freezer. If going the adult chicken route, just make sure the chickens you’re buying aren’t too old or have poor health. If you buy from an auction, you may be getting others cast offs. By talking directly to the farmer, you can probably get a good idea of what you’re buying. Chickens under 2 years old would be the best bet as they are still in their prime egg laying period. Anything older than that and you may find that egg production and even meat quality will be diminished. 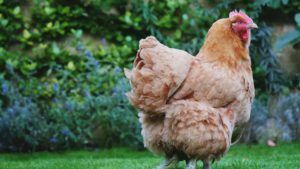 Chicken farmers that get attached to their chickens may likely keep them for many years and be just fine with diminished production – chickens can be like pets sometime so the decreased egg production doesn’t bother everyone. Other farmers will either butcher or sell hens after the 2 year mark since production begins to decrease after that. If you’re still interested in getting the babies, read on! When we started raising chicks, we just went to the farm store and asked a lot of questions about the different varieties and made our choice from there. That worked great! The farm store staff are usually quite knowledgeable about the breeds they carry and can show you pictures of what the chicks will look like when they grow up. We’ve recently bought chicks online and had a great experience! Basically you can buy the fertilized eggs, which are then mailed to you. Many times, the chicks hatch in the box en-route to your home, or shortly after you receive them at your house. It’s so fun buying chicks this way! If they hatch in the box, they can eat the shell they were living in until they are placed in your brooder and can access chick feed. What’s nice about ordering chicks online is that it allows you greater selection than what the farm stores carry. We live in the Pacific NW and bought our chicks from somewhere in the Eastern US. Yep – they shipped them over halfway across the US! It was a blast to do this as we were able to pick a breed of chicken that we wanted but was not available locally. The flip side, of course, is that you will pay more by buying chicks online because of shipping/handling costs. What Breeds Of Chicks Are Best? Again – these are a few of the more common egg laying breeds, many of which can be found at your local farm store or online. 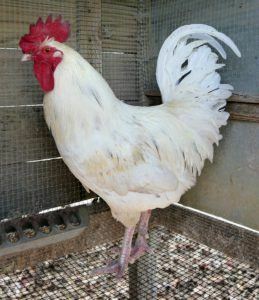 They are all reputable breeds that produce anywhere from 250 to 300 eggs/year. We discuss multiple breeds of chickens, their egg color, number of eggs/yr, personality characteristics here – Photos are also included. If you’re after great meat chickens, you’re in luck. There aren’t as many choices for meat chickens, but the quality of these breeds is excellent, and it only takes 3 – 5 months to get them to butcher weight – incredible! Many of the above egg laying chickens are also dual purpose birds, meaning you can raise them for either egg or meat production (or both). If you want to raise them only for meat, just be aware they don’t reach a finished butcher weight until closer to 6 months of age. Some chicken farmers raise these chickens for egg production initially then, when egg production starts to wane, they butcher them. 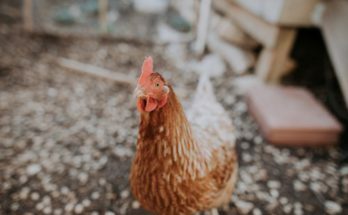 Obviously this may not work for everyone – If you’ve fallen in love with your hens and don’t have the stomach to butcher them, either re-homing them or simply keeping them as pets is just fine! These are just a few dual purpose breeds. Really ANY chicken breed can be used for dual purpose. It really depends on you, as the farmer, and how you want to manage your flock. So you’ve found the perfect chicks to raise – congrats! Now what’s needed to make raising your chicks a successful endeavor? Thankfully, it’s not an overly complex set up! 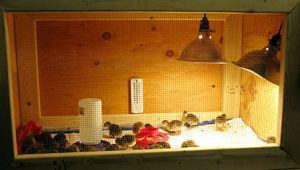 A brooder is basically a short term pen where your chicks can be safely confined while they grow. It provides a predator free, warm environment for them to flourish until they become old enough to transition over to the chicken coop. A brooder can be bought online or at your local farm store. It doesn’t have to be anything fancy – we use a large cardboard box! But other brooder ideas could be a wooden box, a large plastic tote box, or a stock tank. We discuss everything there is to know about brooders here. When you first get your chicks, the ideal temperature in the brooder is 95 degrees F.
To obtain that temperature, a heat source is needed. 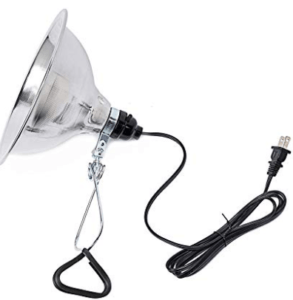 These heat lamps (or brooder lights) aren’t too expensive to buy online or at your local hardware or farm stores. Most of the lights come with a clip that can be used to attach to the side of your brooder. You can adjust the light higher or lower depending on the temperature in the brooder. We put an old standing lamp in ours and the pole of the lamp is what we use to clamp on the brooder light. We just move it up or down on the pole to adjust the temperature. You can place a thermometer in the brooder to get an idea of the temperature if desired. We don’t use a thermometer but look at the chicks to “tell” us if they’re too hot or too cool. If the temperature is too warm, the chicks will not be huddled close together, and may actually be a few inches apart from one another. But if it’s too cold, they will be huddled together in a tight ball. If you see that, it’s a good idea to position the light down a few inches. The ideal temp is when the chicks form a loose huddle together, with just a small bit of space between birds. As your chicks get older, you can lower the temperature by about 5 degrees F per week. This would entail lifting the bulb about 2 inches (give or take) per week to reach the desired temperature. Don’t worry about attaining an exact temperature or setting your brooder light at the perfect level. As a general rule, we position our light a bit lower in the brooder since if the chicks are too warm, they’ll simply scatter or lay further away from the heat bulb. Having about an inch of bedding material on the floor of the brooder helps insulate the birds from the cool surface below. It also gives them something to start scratching around in – It’s fun to watch them start scratching and pecking at things when they’re so small 😊. Bedding can consist of straw, pine shavings, wood pellets, newspapers, leaves, or something similar. We talk about the best type of bedding/litter system here. Chicks need a specially formulated feed, which is different that what they will eat as adult chickens. The farm stores have a supply of the right feeds for your chicks. Or, you can buy the feed online now, if you prefer. 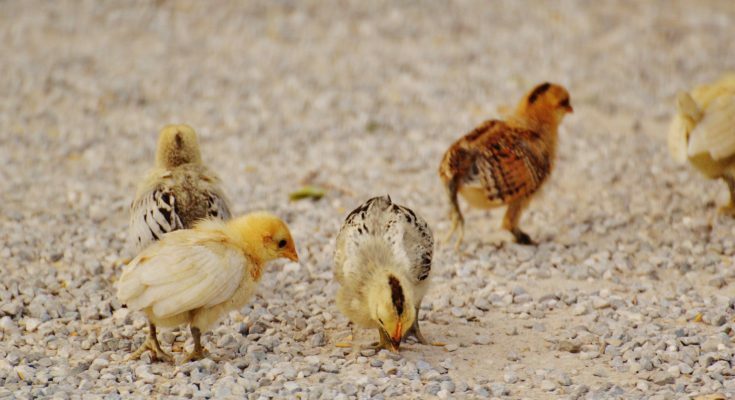 If you prefer to feed you chicks Organic feed – check around your area for organic feed stores, or you can also buy organic feed online. 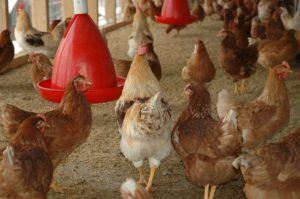 We discuss the different types of chicken feed options in this article. Of course you’ll also need a trough or feeder to feed your little chicks! Feeders can be an old egg carton – yes, like the kind you buy eggs in from the store. Just fill in the 12 (or 18, or 24) egg depressions in the carton and you have yourself a nice little feeder! Like their adult counterparts, though, they can be very messy. So the feeders you buy at the store or online have a top on it so they don’t crawl all over onto the feed, kicking it on the ground, or pooping in it! We made a homemade chicken feeder for nearly free! Click here to see how it’s made. To finish the supply list, your chicks will need a waterer. There are dozens of options at your farm store or that can be bought online. Whatever watering system you use, we like to keep the water container elevated off the ground and inch or two so they don’t walk in and soil it, or kick bedding into it. We use an automatic waterer for our flock – more information on waterers can be found here. Opinions on this vary, but at around the age of 6 weeks, they’ll be wanting to have a bit more space to move around. 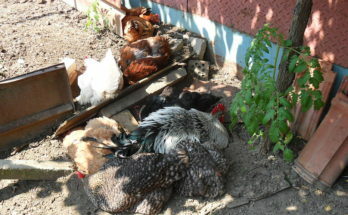 By then, they are much less reliant on the heat source and should have some feathers. They are likely able to tolerate much cooler temps by then, like down to around 70 degrees F, give or take. However, just be aware that if there is a huge temperature difference between the brooder and the coop, it can be traumatic for them. Much of this will depend on where you live…if it’s 70 degrees F in your brooder and you place your birds in a coop that’s 30 degrees, they may not do so well. Adding some supplemental heat in the coop may be warranted at first but if temps are at least 50 degrees or higher, they should be okay. To determine if the temperature is suitable in the coop, replicate the process used when adjusting the temperature in your brooder – Just watch them in the coop to see if they are tightly huddled or if they are forming a more loose huddle. If they look like they are huddling tight as a way to get warmer, you may need to supplement with a brooder bulb until they get more feathers or until the weather gets warmer. The recommended age is about 18 weeks. Again, this does not have to be an exact time frame. 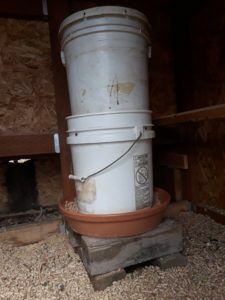 Just be careful not to transition too early – some chicken owners have tried transitioning their chicks to layer feed (for hens) or grower feed (for meat chickens) when they move them to the coop. We believe this is too short of a time frame as they are still growing and need all the ingredients provided by the chick starter feed. 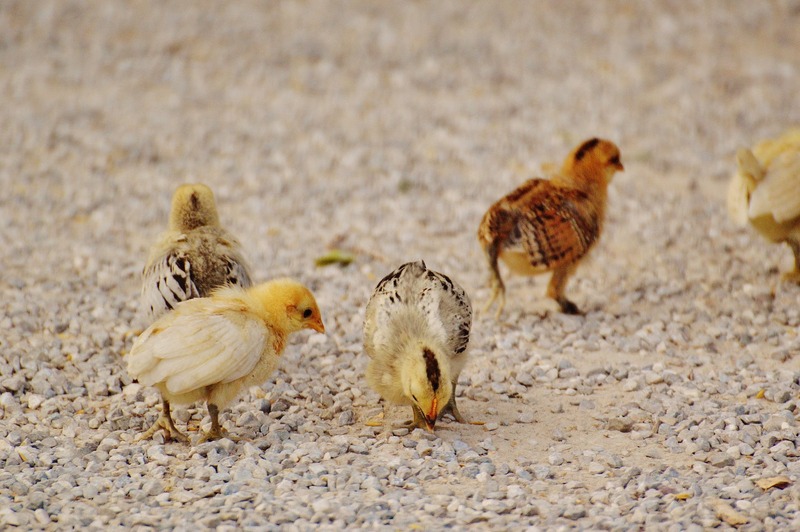 Read more about types of chicken feed here to determine what may work best for your flock! We hope you’ve learned the basics of raising chicks here! We love talking about all things related to raising chickens and sharing our experiences with others. Please leave a comment below if you have any questions about raising chicks, or other insights that would be helpful that we haven’t discussed here. We don’t claim to have all the answers and love learning new things. Hey – we can learn a lot from one another right!